100 1 lb Kraft Window Coffee Bags 4-3/4"x2-1/2"x9-1/2"
1 lb. 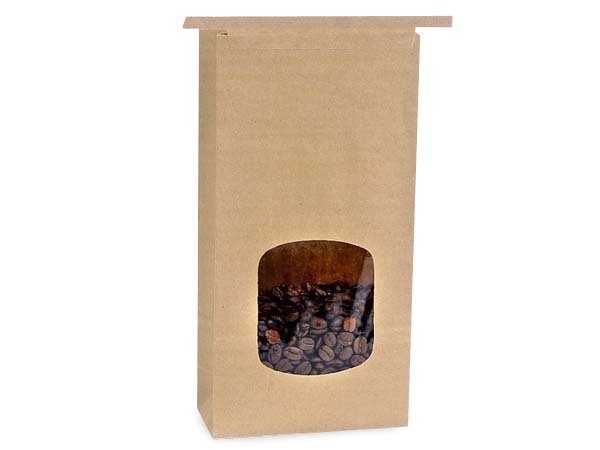 Natural Brown Kraft Tin Tie Coffee Bags with clear window by the 100-Pack. Made from 50# basis Natural Kraft paper with laminated clear poly liner and tin-tie closure. Window size is 2-3/4" x 3". Complies with FDA regulations for food packaging. Made in the USA.